Sen. Robert F. Kennedy, then a candidate for US president, was flying on April 4, 1968, from New York City to Indianapolis, Indiana. During the flight he learned of the death of Martin Luther King, Jr. In spite of warnings that it would not be safe, Kennedy insisted on speaking at his previously scheduled campaign event in Indianapolis. The impromptu eulogy he delivered before a predominantly African American crowd of 2500, may be found at the end of this posting. This passage emerged from a very specific historical moment in Joshua’s life. But its intent is universal. Choices by each of us must be made. We are called to determine the course of our lives based on our choices of the gods we serve. 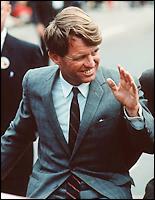 Robert Kennedy faced a confused and potentially angry crowd that night in Indianapolis. Another politician might have played to that potential anger. He made a different choice, choosing hope over fear/anger/hate. Currently there is considerable anger in our political dialogue. An embattled president faces a Congress with many members who have achieved power by promoting fear over hope. It is a formula for short term political gain and long term national disaster. In such a time we might despair. One commenter in a recent posting on this blog admonished me to stop “bouncing back to MLK events”. I do not agree; this is no time to forget history. 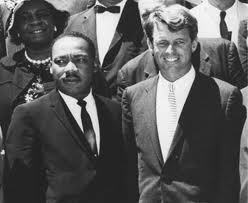 For this reason, I find myself reaching for inspiration from those who have inspired us in the past, such as this historic pairing of Martin Luther King, Jr., and Robert F. Kennedy, whose paths merged on a dark April night in 1968. I spent this year’s Thanksgiving week back home in Georgia, visiting family and old friends. It was in Georgia that as a seminary student in 1955 I was given an opportunity to meet Martin Luther King, Jr. I have written before about this experience. It seems pertinent here. With two fellow seminary students I interviewed Dr. King’s father, the pastor of Atlanta’s Ebenezer Baptist Church, “Daddy” King Sr. The interview was for a course on Race and Religion. At the end of our session with “Daddy” King. he had one last suggestion for us. My son has finished his work for his PhD from Boston University. He will be home this weekend and will be preaching at Ebenezer. I want you boys to come to church to hear him. You can meet him after church. I don’t know about my fellow students, but I was free that Sunday. Did I return to Ebenezer? I did not, one choice that ranks close to the top of my list of regrets in life. Eight years later, I finally met Martin, Jr., in Chicago, when I interviewed him for a magazine I then edited. I told him of my missed opportunity. We compared notes on our lives. We were born 46 miles, and less than three months apart in Georgia. Our paths were close, but in the segregated South they did not cross. When Dr. King died, the world lost a champion of justice and hope. It did not, however, lose his message of hope over fear, a message badly needed in this nation at this time. During his lifetime, King was the victim of massive vilification and the brutality of racial segregation. The vilification increased after he became an outspoken critic of the Vietnam War. King inspires me still, as he surely does most who know his story. Few of us can remotely compare ourselves to King; we can only rejoice that for a few short years he brought us a message of hope over fear in a manner we can only try to emulate. In recent weeks, this blog has been reaching a larger audience, thanks to the wide range of the internet. Web sites from Oregon to Dubai have linked to postings from this blog. Some who encounter these links are pleased; others are made angry enough to say harsh things about the blog, nothing of course, as harsh as those that were said about King, but harsh enough to provoke the ever-present temptation to consider giving up the god of hope in favor of the easier path of fear and anger. One reason I prefer to choose hope is the strength of the internet international peace and justice network which has embraced the campaign to end the illegal and immoral occupation of Palestinian people and land. One US Presbyterian blogger, for example, has accused Debbie Menon, a blogger located in Dubai of linking to a “horribly anti-Semitic site”, not mine in this case, but another blog, bringing back the old “guilt by association” line of attack. This tactic works for some people. But I find that the easy use of anti-semitism in a political discussion has largely lost its cache and become instead, an exploitation of an ugly and demeaning act of hatred. My own brief moment in the vilification derby sun came recently when another Presbyterian blogger, a Reformed pastor, employed the title, James Wall: Sewer Dweller, when he wrote about my most recent posting. Looks like we’ve got another anti-Israel activist who likes to go dredging around in the muck, and this one may come as a surprise to some. It’s James Wall, the former long-time editor-in-chief of the Christian Century, and it appears that he’s been hitting the pages of my favorite sludge-bucket. This four minute plus, video of that night in Indianapolis, was filmed a few hours after Martin Luther King’s assassination. In it, Robert Kennedy speaks from his deep conviction that it was not a time for justified anger, but a time to choose the path of hope and love over the path of hate and fear. It is the message that fits any moment in history when justice is denied. This entry was posted in Middle East Politics, Religion and politics. Bookmark the permalink. An enormous thank you for this piece. All I can say is keep doing what you’re doing. It is greatly appreciated by so many of us. “… blessed are you whenever people insult you, persecute you, and say all sorts of evil things against you falsely because of me!” I think he didn’t mean specifically “me,” but what he stood for. Blessed are you, Jim, for the good work you do. Glad to here your blog is extending out. Sorry to learn of persons who don’t know how to use words, handle “truth” or respond to thoughtful insights. Thank you John, for referencing Isa 2:1-5 and referring to the imbroglio in Israel/Palestine. Indeed, we must literally refuse to spend on military weapons and invest in impliments of agriculture and commerce, helping to empower ALL persons, cultures, nations and language groups in the “global community”. Though Jesus said there will (always) be wars and rumours of wars, he means that we “make peace” here and now; not wait for him to “bring” it. We must embody it, making the right choices. The Palestinians are indeed at the back of the bus. It is they who have made all the concessions, while the Israelis continue to create “facts on the ground”, uprooting the vines and fig trees that Palestinians mean to cultivate with their “ploughshares and pruning hooks”. Thank you for bringing attention to their plight. Please alert your readers to the excellent DVD produced by UK fellow Porter Speakman (and The Rev Stephen Sizer). It is called WITH GOD ON OUR SIDE. It calls attention to the heresy called “Christian Zionism”, giving their spokespersons a chance to voice their views. Then it systematically demolishes their arguments with a better view of scriptural interpretation, making room for all nations to enjoy their vines and fig trees. It is available through AMAZON (USA) for $14.95. There are no words to describe the ENORMOUS HOPE that you provide us readers with your amazingly brilliant articles and words of wisdom that the teachings of Christ are still adhered to by many in our country. We can never thank you enough for that. You remind us that, inspite of all the so-called “Christian” Zionist Pharisees’ who have taken deceptive platforms in the crevices of the statue of BAAL ISRAEL, the state, not Judaism, nor Christianity, His Truth will overcome all evil and ignorance. Please continue your PHENOMINAL work because it has revealing and healing powers that are no less miraculous than what went on 2000 years ago in the heart of Palestine. I’m grateful, Jim, for your reminiscenses about Martin Luther King Jr. and and for your candor in reflecting on the way people with more bias than brains, and who lack both sensitivity and savvy, try to knock down your thoughtful analysis. They go beyond honest debate. There are times when we all need “second opinions” and to test our perceptions against those of others. But those who use words like “sewer dweller” display more about themselves than they do about others. We need–urgently–the wisdom that comes from people like you with both experience and conviction. Thanks for your continued writings. Thank you for your blog. I had forgotten all about what happened on the day MLK died. George flew to Knoxville to visit a black friend . He had taken a cab and was unsure of the address. George ask the cabbie to stop so he could get directions and the blacks on the corner were not friendly…Geo said “why do you think I’m here”…and they said that’s right brother and tension was eased. The Kennedy brothers had great ability with words as did Clinton…and now Obama . Obama actually lives his beliefs unlike the other three. The democratic politicians have failed to stand behind their leader. What a mess we find ourselves in. It is entirely possible to support some policies of Israel and condemn others. It is also possible to find one’s self in the midst of people (in an internet sense) with whom one may not entirely agree. Veterans Today may say some things that are good and appropriate. Unfortunately some of the writers on that web page are Holocaust deniers and believe that the United States and the world economic system are controlled by the Jews. Maybe we could lower our tones a bit and see the good and the bad in what each has to say? Thank you! After 62 years of being demonized by the Israeli public relations campaign, this Palestinian-American Presbyterian thanks you for your inspirational courage.